After purchasing a MacBook Air, but not being able to find a suitable docking station for it. Semiconductor design engineer Kitae Kwon from Cupertino CA. Decided to take matters into his own hands, and created the LandingZone MacBook Air Dock. The LandingZone is currently starting it journey over on the KickStarter website, and allows you to easily connect your MacBook Air to an external display and peripherals. Watch the LandingZone in action after the jump. The new MacBook Air LandingZone dock is equipped with 4 x USB 2.0 ports and removes the need to use and external USB hub. Together with a 10/100T Ethernet port, Mini DisplayPort as well as a locking port compatible with all the Kensington Locks. Two models have been created to support either the 11″ or 13″ version of the MacBook Air (2010 or later), and both come with a US power adapter which accepts wide range of input voltage (100~240 Vac). 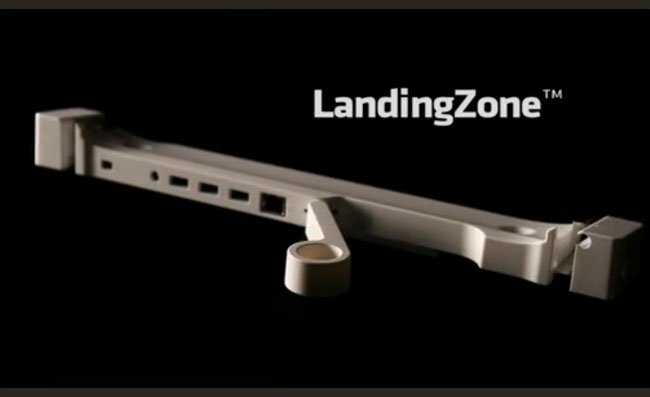 Form more information and to make a pledge to help the LandingZone MacBook Air dock make the jump from concept to production, visit the KickStarter website.